Myanmar continues to backslide on reforms. It might be time to stop giving its leaders the benefit of the doubt. Myanmar, or Burma as some people prefer to call it, has been cut much slack in recent years with its supporters urging patience and understanding as it attempts to reform itself. This was highlighted by the recent visit of U.S. President Barack Obama, who had hoped to coax further reforms out of Naypyidaw and President Thein Sein during the recent East Asia summit. This generosity of spirit has been misplaced. And given what has taken place since Obama left, the attempts by Thein Sein and his cohorts in the military to convince the world that change is genuine look increasingly likely to end in failure. Since the U.S. president left, political maneuvers have diminished the chances of opposition leader Aung San Suu Kyi standing at the next election; U.S. companies have been found skirting sanctions by registering in Singapore; the pace of Rohingya fleeing persecution has escalated; and peace talks with Kachin rebels took a blow after a government attack left 20 people dead and another 16 wounded. All within the space of a week. Dealing with religious and ethnic differences was never Thein Sein’s strongest suit. More than 100,000 Muslim Rohingya have fled Buddhist Myanmar by boat over the last two years, more than 15,000 since mid-October. On the Kachin front, just one of many ethnic rebel groups that have been fighting the government for decades resulting in tens of thousands of deaths, temporary ceasefires have been signed but permanent peace deals have proved elusive. Kachin peace negotiator Hkun-Ja said a return to ceasefire talks between the two sides is now uncertain. Meanwhile lower house chairman Shwe Mann, who intends to run for president next year, has said constitutional amendments barring Suu Kyi from contesting the presidency – because her children hold British citizenship – and giving the military a legislative veto, could only be changed after a new parliament is convened. That would ensure that any constitutional change brought about by a referendum due in May would not become effective until after the next general election, thus bolstering his own chances of victory by guaranteeing that Suu Kyi remains out of the contest. “We can’t afford in the present political and administrative scenario to make any mistakes in amending the constitution right now,” he said. It was a dirty trick. Critics have argued the opening up of Myanmar was simply an opportunity to legitimize a range of illegal and dodgy business interests. That enabled the generals who run the country to keep the fortunes they had amassed over 50-years of dictatorial rule by swapping uniforms for business suits with the approval of Western governments, justifiably anxious to see the country emerge from an almost North Korean-like existence. 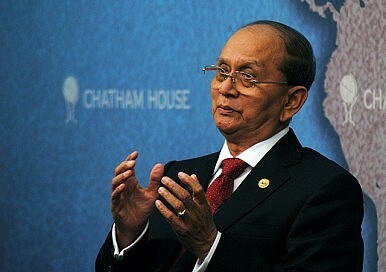 Thein Sein has been strong on saying what the developed world wants to hear and he has been given the benefit of many doubts, including broad acceptance for a decades-long push by the generals to rid the country of the name “Burma” and adopt “Myanmar” instead – a name that struggles to resonate. Obama annoyed more than a few during his trip by calling it Myanmar, which does go against the grain of the U.S. State Department policy, which still prefers the name Burma. But four years after reforms were introduced, backsliding has escalated dramatically and become the order of the day. Perhaps it’s time Obama listened to his own bureaucrats and the rest of us can follow suit by just calling it Burma.